This little kid is called Steve and there is a mission for him. 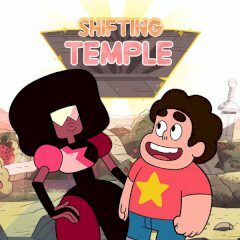 Steve should enter the temple and find all gems inside. Rotate the temple and play with gravity to get them all! Explore the temple full of gems, various traps and creatures. Rotate the structure to play with gravity inside, avoid touching creatures and use some of additional abilities. Spend crystals to get magnets and time freezers. End the level as fast as you can and get all three stars for successful and quick completion.